Like many towns in Belgium and Holland Bruges is ringed by water, it’s part of the charm of their towns. 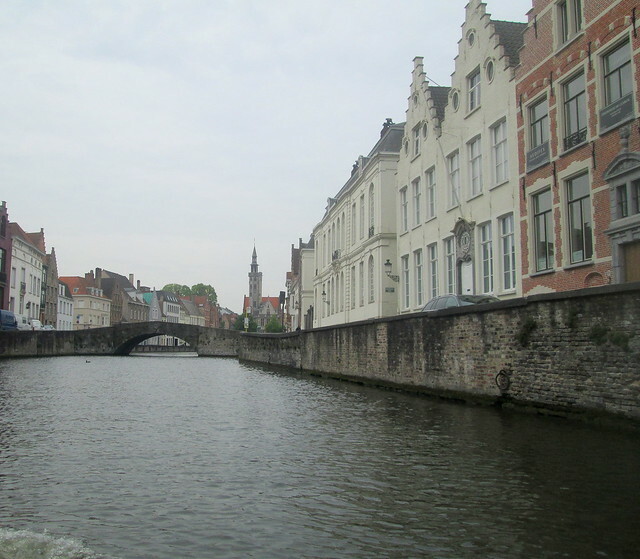 Bruges is in west Flanders and is known as the Venice of the north. The city centre is a UNESCO World Heritage site. Mind you, I don’t think I would like to be living in one of the houses that have water lapping at their walls, they must be terribly damp. There have been settlements in this area since the Bronze Age. Anyway, we decided that a trip on the canal was a must although as the boat filled up with fellow tourists I was looking over the edge and wondering if it was safe, they don’t half pack people in! I think it is partly the boat trip that made me think that Bruges was so busy with tourists because when I look at the other photos it doesn’t look too crowded. The name Bruges actually means bridges – obviously because there are so many small bridges all over the town, they’re all quite low but there’s only one that you have to duck your head to get under it though, when you’re in the boat. This is definitely the best way to get a view of the many ancient buildings around the town. It must be quite annoying though for the people living in the houses with constant tourist filled boats going past – with a guide talking through a microphone. 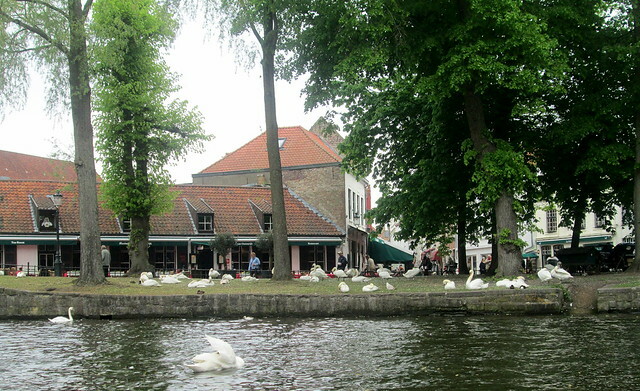 The swans mainly seem to congregate in this area, probably they take to the water when the boats retire for the evening. We noticed what seemed to be two Swaene Hotels, a bit confusing. 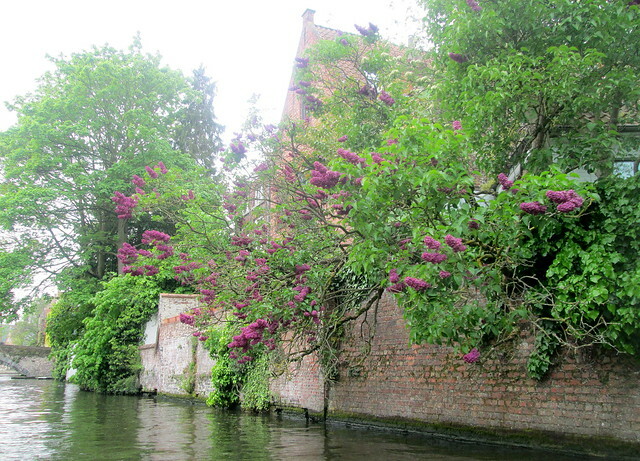 A lovely lilac tree overhung the canal. More photos of Bruges will be forthcoming, eventually! 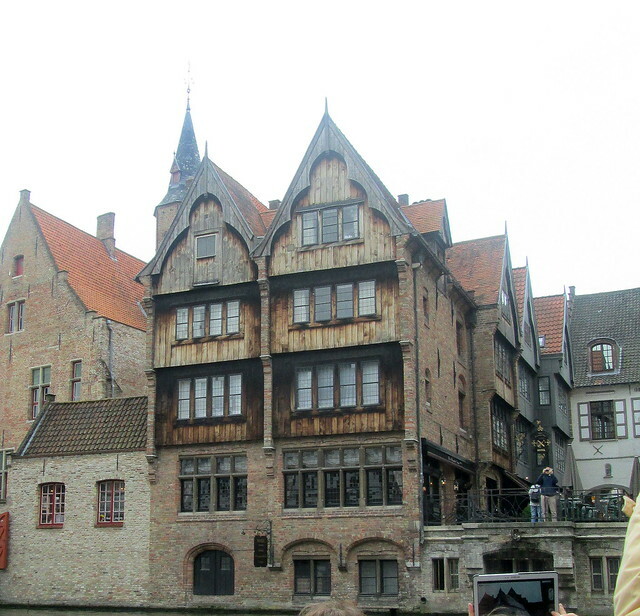 This entry was posted in Architecture, Bridges, Personal, Towns and tagged Belgium, Bruges, medieval European houses by Katrina. Bookmark the permalink. I am enjoying your “tour” of Bruges, Belgium, a country I’ve long wanted to visit. I had no idea of the canals and similarities to Venice, and I look forward to more of your photos. 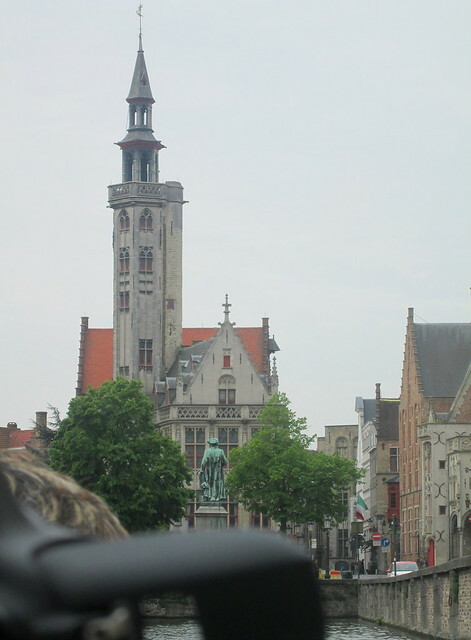 We were only in Bruges for a day before moving on to Ypres but I still have plenty of photos to show you. 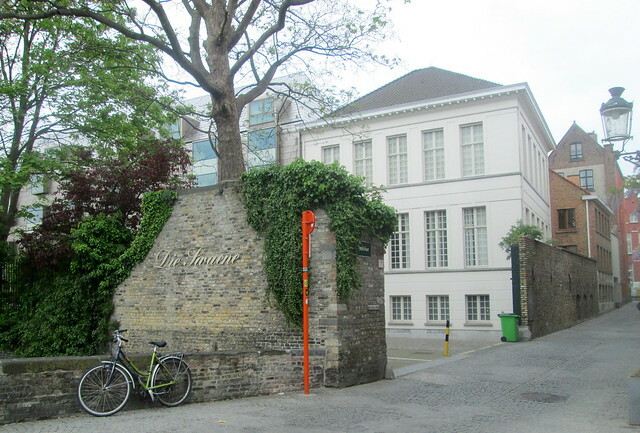 The second Die Swaene hotel in your photos is the one we stayed at. In fact, if you go to their web site, the first room photo, an attic room with sloping roofs, is the one we stayed in! It was wonderful! Great memories. I thought it was most likely to be the second one! It is a very pretty place and close to a big ferry port so it’s fairly easy for people to get there. 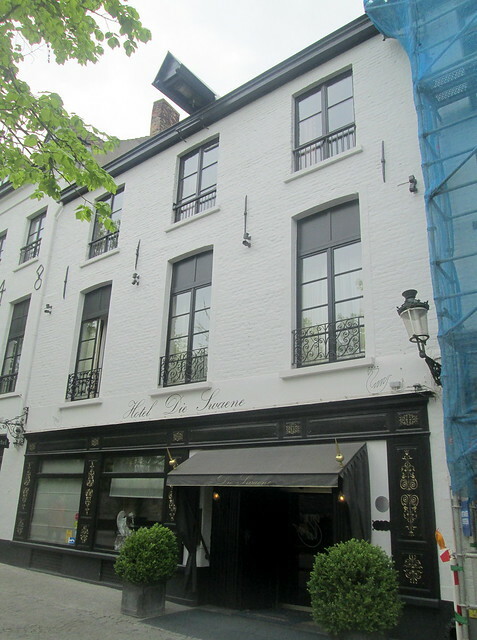 I’ll do more blogposts of Bruges soon. What was the mystery series? 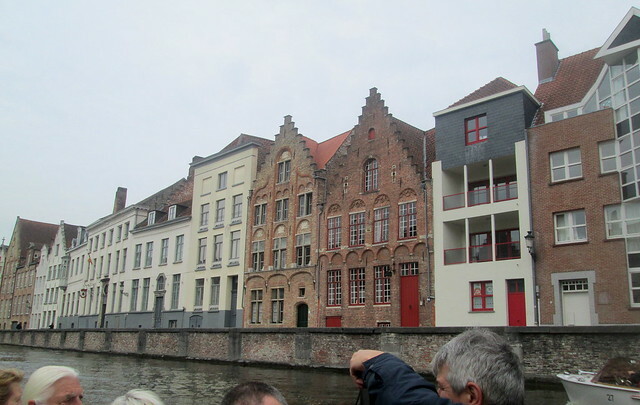 You have a photo of buildings along the canal (4th one down I think) which shows houses from a variety of eras. They blend together so well. I agree, even that fairly modern one on the right of centre seems to fit in well. I think the oldest ones are the crow-stepped gable houses, in Scotland we copied that design from the Dutch and also used their red pan tiles on houses here, they were used as ballast in Dutch ships. Your photo of the lilac tree overhanging the canal is spectacular. I just love it. In fact, all of your photos of Bruges are intensely interesting to me. I know I’ve mentioned it in passing, but my Uncle Dana (my mother’s older brother) was there during the Battle of the Bulge, and managed to actually post several letters to family members from there. As is so often the case, nothing said about the brutal cold and snow, the horrors of the battle that we knew he endured due to his PTSD afterwards, and so forth. In his letter, he only spoke of a Belgian boy that his comrades befriended, who, on a wintry night led them through the woods to his family’s farmhouse for a savory rabbit stew. It’s hard to imagine what it must have been like for the people in European countries that had been invaded by the Nazis. Jack’s father was in Holland in 1945, but I don’t think he got to Belgium, he had been in it since 1939 and was evacuated from Dunkirk. It always amazed me when I heard what people I knew had done in the war (usually from someone else as they didn’t talk about it) – then came home and just picked up their lives again.